Carbon Nano tubes are one of the most versatile conductive materials around. They have high electrical and thermal conductivity and are very flexible in nature. It means they can endure lots of bending and still remain intact and they outperform copper and steel in both electrical and mechanical areas. They are made by threading carbon atoms together via electro chemistry. The tubes can be used in fields from energy storage to thermal conductivity. The inherent strength of graphene occurs as a result of its 0.142 Nm-long carbon bonds, which measure at a final tensile strength of 130,000,000,000 Pascals, or 130 gigapascals. Carbon nanotubes are being used more and more in a broad range of applications in the field of nanotechnology, in large part due to their strength and elasticity. Some of the numerous areas include: field emission, thermal materials, energy storage, catalyst support and even air and water filtration. The diameter and the degree of twist achieved in the electro-chemistry process involved in making them explain their relatively higher degree of conductivity. 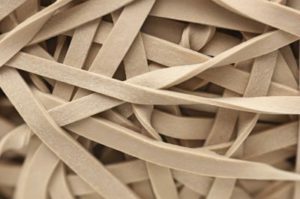 Graphene elastic bands also exhibits exceptional elastic properties, which is clearly shown by its ability to retain its initial size after strain without inducing any type of imperfection or deformation to the material after its recoil. These specific properties of graphene allow this material to find its useful application in a wide variety of industries, some of which include optical electronics, biological engineering, ultra-filtration systems, composite materials, photovoltaic cells, energy storage systems and much more.